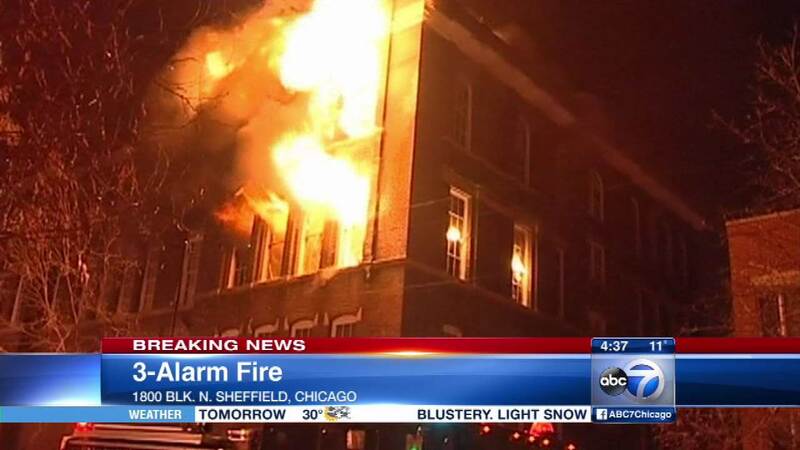 CHICAGO (WLS) -- Chicago firefighters have extinguished an earlier three-alarm blaze at the former James Mulligan Public School Building in the city's Lincoln Park neighborhood. CTA Brown Line service has resumed after it was temporarily suspended for most of the morning between the Fullerton station and the Merchandise Mart. Brown Line trains were running through the Red Line subway for Loop service. CTA Purple Line and Purple Line Express service was also temporarily suspended between the Howard station and the Loop, but officials say the Purple Line Express will resume normal service for the Tuesday evening rush hour. Dozens of firefighters responded to the scene in the 1800-block of North Sheffield Avenue around 2 a.m. Tuesday, where flames could be seen shooting from the top two floors. Neighbors were evacuated from their homes as a precaution. An earlier rekindling of the blaze caused crews to remain at the scene. The 124-year-old structure was empty and appeared to be under construction when the fire broke out. There is no word on injuries or what may have sparked the fire. The building, which first opened for students in September 1890, was being considered for historic landmark status in February, according to a city document. It was closed in the early 2000s and remained vacant until the Board of Education sold it to a private developer, the document said. Red Line service was temporarily suspended between the Belmont and Grand stations but was back in service by about 2:10 a.m., operating with residual delays, according to the CTA.